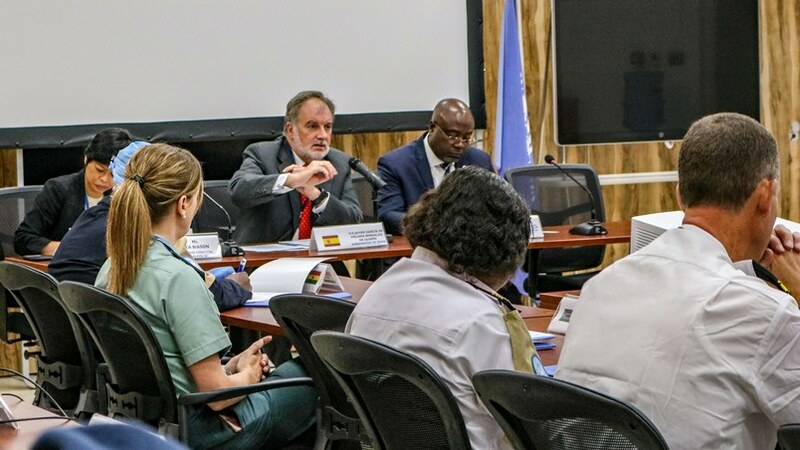 Entebbe, UGANDA (Oct.2, 2018) – The Ambassador of Spain to Kenya and Uganda, His Excellency Javier García de Viedma Bernaldo de Quirós, visited the Regional Service Centre Entebbe on Oct.1st, 2018 to inaugurate the United Nations Police Gender Adviser Course which the Government of Spain contributed towards. During the visit, the ambassador met with RSCE Chief, Mr. Paulin Djomo and the only Spanish national at the Entebbe Support Base, Ms. Elisa Revert Santamaría. The RSCE Chief, provided a comprehensive overview of the work of the RSCE, that was followed by the tour of the RSCE installation. The Police Gender Adviser Course that is running throughout the week comprised of 33 police officers representing nine field missions. The course was designed to build host nation capacity by reforming and restructuring policies and procedures promoting equal rights between men and women. Prior to classroom attendance, the officers were required to complete an online preparatory course which served as a foundation for the more advanced concepts to be discussed during the six days at the Regional Training and Conference Centre from Oct. 1st to 6th. According to the UN Security Council Resolutions on Women, Peace and Security, there’s integration of gender perspectives in all efforts of conflict prevention and resolution. These resolutions call for women’s equal participation in all the phases of planning, design, implementation, monitoring and evaluation of peace and security processes. Under this concept, mainstreaming gender concerns in the work of the United Nations Police is considered essential as it plays an important role in the protection of civilians after the conflict, reinforcement of security in peace operations and rebuilding of domestic police services. Gender Adviser Course is just one of the 200 courses that the RSCE Conference and Training Centre in Entebbe hosts annually.